Hortus Camdenensis | Sparaxis fragrans (Jacq.) Ker-Gawl. ssp. grandiflora (D.Delaroche) Goldbl. Sparaxis fragrans (Jacq.) Ker-Gawl. subsp. grandiflora (D.Delaroche) Goldbl. Variable species with basal fans of lance-shaped leaves and spikes of up to 6, flattish, widely funnel-shaped, flowers in spring and summer. There are four ssp., grandiflora, with deep reddish-purple flowers; fimbriata with cream flowers; acutiloba with yellow flowers; and violacea with white flowers marked purple, shading to purple marked with white. To 45cm. [RHSE, CECB]. ‘It is a small bulbous rooted plant, producing very rich and beautiful flowers; they are usually in season in the month of May, and open in the morning sun, closing each evening, for a few days.’ [LBC no.1085/1825]. ‘[Ixia grandiflora] varies with violet, white, bluish, purple, and striped flowers, also with flowers white on the inside and purple without, with a star at the base. This last is the Sisyrinchium of Commelin, above quoted, being much taller, with longer slenderer leaves, may be a distinct species; but this with grandiflora, bulbifera, and what is, perhaps, a variety of this, lacera of the Linnean Herbarium, are so nearly allied, that it is difficult to define their differences.’ Figured is a form with purplish flowers. [BM t.541/1801]. Figured at BM t.779/1804 as Sparaxis grandiflora var. b. ‘Streaked-Flowered Sparaxis’ is what appears to be violacea. Paxton's Dictionary lists two varieties, liliago, with white flowers, and striata with variegated flowers. The latter was the form figured in the Botanical Register [BR f.258/1818], according to which it was introduced to Britain by Miller at the Chelsea Physic Garden in 1758. The Ornamental Flower Garden figures two plants, Sparaxis lineata Sw. [OFG f.243/1854], and S. stellaris D.Don [OFG f.242/1854], which are both forms of S. grandiflora. Listed in all published catalogues [B.414/1843]. 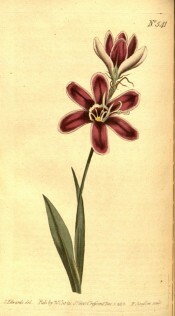 Ixia grandiflora was received per ‘Sovereign’ February 1831. [MP A2948]. See also Ixia longituba N.E.Br. More details about Sparaxis fragrans (Jacq.) Ker-Gawl. subsp. grandiflora (D.Delaroche) Goldbl.